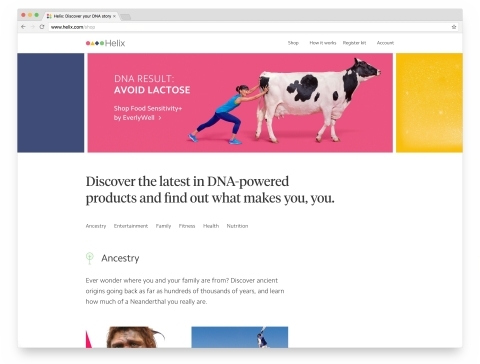 SAN CARLOS, Calif.--(BUSINESS WIRE)--Helix, a personal genomics company, today launched the first online marketplace for DNA-powered products that offer insights on ancestry, entertainment, family, fitness, health and nutrition. Helix created the marketplace, Helix.com, by forging partnerships with innovative fitness and nutrition app developers, emerging genomics companies, and established healthcare institutions that were interested in or already integrating DNA sequencing into their commercial offerings. Helix’s inaugural marketplace partners include Admera Health, Azumio, DNAFit, Dot One, EverlyWell, Exploragen, Genome Medical, Insitome, Lose It!, National Geographic, Sema4, and Vinome. The company also has a roster of coming-soon partners, and anticipates launching products from additional partners including Geisinger, HumanCode, Intelliseq, Invitae, Mayo Clinic, Precise.ly, and WellnessFX in 2017. “We're very excited to offer DNA-powered products on Helix’s first-of-its-kind marketplace, which will allow every person to have greater visibility into their personal genomics data,” said Admera Health’s President and CEO, Guanghui Hu, PhD. "The ability to harness Next Generation Sequencing technology to identify genetic markers that research has linked to medically actionable diseases is ground-breaking, and will allow individuals to take ownership of their health." Unlike other personal genomics companies that require a separate DNA sample for each test they provide, Helix collects and sequences a DNA sample once, and then securely stores and protects a customer’s DNA so they can order additional DNA-powered products from the Helix marketplace without providing another saliva sample. A customer's first purchase on Helix.com requires a saliva collection kit that has a onetime cost of $80. When a customer mails in a saliva sample to Helix’s CLIA- and CAP-accredited sequencing lab, their DNA is read with the Exome+ assay. 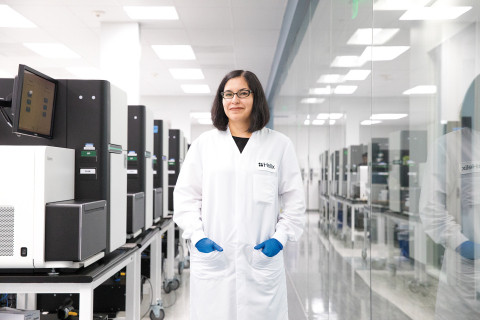 Exome+ is a proprietary Next Generation Sequencing (NGS) assay that sequences all 22,000 protein-coding genes as well as additional information-rich areas identified by Helix’s scientific team. This yields 100 times more data than other techniques such as microarrays. Once the DNA is read, Helix securely shares only the relevant portion of a customer’s DNA data with the partner whose product the customer ordered, all with the express consent of the customer at the time of purchase. The partner then analyzes the data and provides insights directly to the customer. When a customer makes a subsequent purchase on Helix.com, they are only charged for the cost of the DNA-powered product, without any additional saliva kit required. The Helix marketplace also offers customers access to independent genetic counseling before or after ordering any of their products through Genome Medical, a new genetics medical practice with a telemedicine network of genetic counselors and physicians. “Furthering the understanding of DNA as well as creating a safe and responsible way for our customers to interact with DNA-powered products are central to the success of our marketplace, and partnering with Genome Medical to offer education and counseling to help our customers navigate the genomics landscape helps us achieve both,” Thurston added. The Helix marketplace, located at www.helix.com, is currently available to U.S. residents. For more information, please visit www.helix.com/press.